Our thanks to Don Jeerings for sharing these photos from this year's field day. 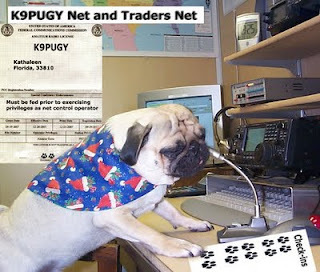 No bones about it, the club needs net operators. All it takes is a little effort on your part. Of course, a pleasant personality, a gift for gab, and deep voice doesn’t hurt, but even if you’re not a natural like me, you can be trained. With a little coaching you will do just fine. I know what your thinking. Look, we all have a lot on our bowl these days. But that’s no excuse for rolling over and playing dead. A little effort on your part can make a big difference. So get off the couch, drop the ball for once, and grab the mike. Become a net operator. There, I’ve said it. Please don’t make me beg. "If at first you don't succeed . . . "
After breezing through his Technician in June, Tyler Asay missed his General in August by one point. Undaunted, he hit the books, and a few days later during a special session he retook the test. The extra effort paid off. Tyler is now counted among the General Licenses in the club, including his uncle Steve Asay who upgraded to General in June. Tyler has set his sites on getting that Extra license, as well as doing well in school. He enters the ninth grade this year. We wish him well on both counts! Good going Tyler. You are in inspiration to all of us. Field day is the one day in the year when amateur radio operators get to practice for an emergency in an organized way. Almost out of nowhere, antennas appear and hams all over the country focus on communicating by the many modes of radio technology available to them. These range from Morse code, to relaying messages from satellites flying overhead to hams halfway around the world. But it’s not all work. It is a fun time as well for young and young at heart. This year, Bay9 News dropped by. Not only did they do a great job covering the event, they also painted a great picture of what amateur radio is all about. This year as years in the past, LARC supported the “March of Dimes-March For Babies”, a truly worthy cause. Fourteen club members supplied auxiliary communications for the event. The volunteer services were greatly appreciated by the organizers, and as a bonus, club members got the opportunity to fine-tune their radio skills. 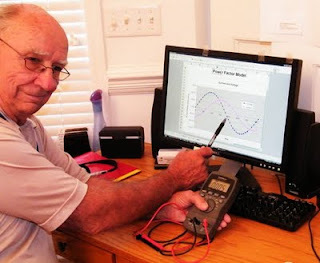 Don Jeerings, assisted by his wife Norma, addressed the concept of power factor by way of a hands on demonstration. Resistive, capacitive, and inductive loads and their effect on phase angle were demonstrated for all to see.